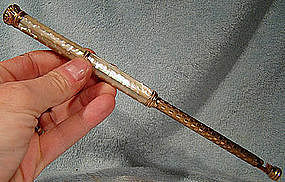 A mother of pearl rgp telescoping lorgnette handle from the 1890s. This eyeglasses extending handle is made of ornate rolled gold plate and hand carved mother of pearl panels with nice colour flash. It measures 5-1/4" when closed and 9-3/8" when opened. The top is 5/8" across, the extension has a fine checkerboard pattern, and the retaining inserts for the eyeglass frame are made of tortoiseshell. The opening is 3.5 mm. and the internal span is 10 mm. This unsigned high quality optical accessory in excellent original condition with no chips, cracks, dents, bends, corrosion, losses, damage or repairs. All items are thoroughly and conservatively graded and all condition issues are noted; all items are vintage or antique and may have slight signs of gentle use. Expedited tracked and insured parcel shipping to the U.S. starts at $21 (other spots may vary, air is higher). Items paid with a credit card will be shipped to confirmed addresses only. We do ship internationally. All of our prices are in $US. PLEASE NOTE: We DO NOT accept PayPal. 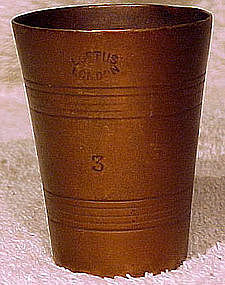 A 19thC W.R. Loftus, London bronze cup measure. This late 19thC hand-made 2-1/4" bronze measuring cup was made by W.R. Loftus of 146 & 320 Oxford St., London, England. In business from c1860-1940, this company made pewter, beer machinery, bar fittings and also scientific equipment. This tapered cup has a ringed design and it is stamped LOFTUS LONDON 3. It has a brass soldered seam and bottom insert, and it is in excellent original condition with no dents, corrosion, losses, damage or repairs other than some minor patina from use and some minor bending of the upper rim. All items are thoroughly and conservatively graded and all condition issues are noted; all items are vintage or antique and may have slight signs of gentle use. Tracked Packet shipping to anywhere in the U.S. is $14.50 - this includes online tracking, air service and insurance up to $70. Items paid with a credit card will be shipped to confirmed addresses only. We do ship internationally. All of our prices are in $US. PLEASE NOTE: We DO NOT accept PayPal. A huge and vintage unsigned socket-blade cabinetmaker's slotted screwdriver c1910-20. This furniture maker's tool measures 18" long, including the 7-1/2" faceted massive wood handle with brass ferrule and N initial. The hexagonal 1/2" wide blade is firmly mounted, and this vintage tool has a wonderful patina. This item is in excellent original condition with no chips, dents, bends, corrosion, losses, damage or repairs other than some possibly newer varnish on the handle covering a tight crack on the handle, and the end of the driver which has been sharpened in the past. All items are thoroughly and conservatively graded and all condition issues are noted; all items are secondhand and may have slight signs of gentle use. Surface shipping to the continental U.S. is $9.50 (other spots may vary) - insured is higher, and mandatory on items over $85 if paid with a credit card. Items paid with a credit card will be shipped to confirmed addresses only. We do ship internationally. All of our prices are in $US. An early to mid 19th century turned yew (or fruit) wood covered gaming cup with 9 hand carved and painted bone die c1820-50. 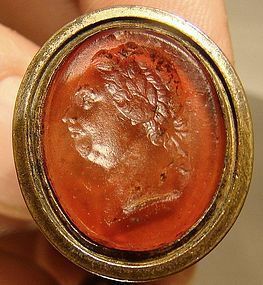 The box retains some of its original red stain and it measures 2-1/8" tall and 1-1/4" across the top. 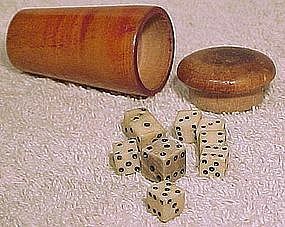 The dice are also 19th century vintage, and measure 3/8" (largest), 5/16" (medium) and the remaining seven are 1/4" across. This gambling or gaming item is in excellent original condition with no chips, cracks, scrapes, losses, damage or repairs other than the loss of much of the original red staining. It is a little smaller in size than usual, doubtless to make it easy to conceal if necessary... All items are thoroughly and conservatively graded and all condition issues are noted. Expedited tracked insured post starts at $20 (to the US - other spots may vary) - insurance and tracking included in shipping quotes. We do ship internationally. All of our prices are in $US. PLEASE NOTE: We DO NOT accept Paypal.